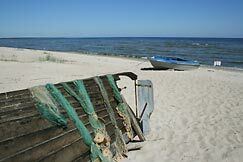 Plienciems is not only an old fishing village, it is also one of the oldest health resorts in Latvia. Written data on the health resort in Plienciems are found since 1738. It was a renowned resort in the 18th century – chosen by landlords and clergymen and their families as a place for swimming and resting. In 1810 Elizabeth, the wife of the Russian tsar Alexander I, spent six weeks there. There is a sandy beach near the sea; but the village is protected from sharp wind by a great landscape feature – white dune of Plienciems. National natural restricted area “Dune of Plienciems” lies approximately 300 meters from holiday house „RIEKSTNIEKI”. The restricted area was found in 1987, since year 2004 it has been included in Europe’s most protected areas – NATURA 2000. The area was established to protect the notable and continuous costal dune bank. The dune bank is covered with old pinewood; arenaceous flora is characteristic of the area. The area has a heritage value as well. The restricted area has a notable terrain shape, peculiar flora and fauna and ecosystems are characteristic to the dynamic seashore. There is the largest dune deflation lowland in Latvia – Vabu area or the White dune. The restricted area is 60.58 ha large. There are several protected biotopes of Latvia and Europe in the protected area: woody seaside dunes, grey dunes and front dunes. There are skiing hills “Jēkaba grava” and “Milzkalns” at a distance ~ 10 km from the house. Rides on quadracycles are offered at “Milzkalns” at any season. More information is available at home page www.milzkalns.lv. The lake Engure, the richest in birds in Latvia, is located approximately 15–20 min drive from the house. 169 different bird species live in it and in the surroundings (some of the species are even included in the World’s Red Book). Many various plants are found there as well, including some from the Red Book. Near the lake Engure there are bird watching towers, a pathway of wild orchids (in blossoms during May and June), wild cow and horse pasture. The lake Engure is a very good place for fishermen. A boat is needed to fish in the lake for its banks are scrubby. Boats can be rented at several boat depots near the lake. More information on the lake is available at www.eedp.lv. The house is located approximately 30 km from Jurmala city and 65 km from Riga. Marija Hill or Engure Castle Mound (national archaeological monument). Engure Church (built in 1804, one of a few wooden churches). Set up in 1853. National art monument. the monument relating to the history of civilization. Graveyard of Finnish soldiers in Klapkalnciems. (a transformed 19th century wooden building - servant house, built in 1877, barn – in 1867, drying-house – in 1870.